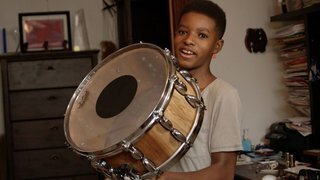 Kojo is a short documentary on gifted 12-year-old jazz drummer Kojo Odu Roney. In this candid interview, Kojo reflects on his tireless work ethic, the current state of jazz music, learning from his mentor and father, jazz saxophonist Antoine Roney, and much more. Kojo's charisma, sensibility and passion are as mesmerizing as his drum skills. Michael Fequiere is a Brooklyn based filmmaker. He attended the City College of New York where he received his BFA in video production. His thesis film (Faux Pas, 2009) won best directing and best editing at the CCNY student film festival. The film also screened at the Big Apple Film Festival and the Cannes Film Festival’s Short Film Corner. He later directed a short sci-fi thriller (Traum, 2011) that was featured on IndieWire’s Shadow & Act blog. In 2013 Michael teamed up with Austrian body-painter Neil Curtis and directed him in the provocative short documentary Replace Clothes with Paint. The film screened at the L.E.S. Film Festival and the Fresh Fruit Film Festival. His latest short film, Kojo: A Short Documentary, is a short profile piece on prodigy jazz drummer Kojo Roney. The film has already won numerous awards and continues to do well in the festival circuit playing at TIFF (Toronto International Film Festival) AFI DOCS (American Film Institute), MSPIFF (Minnesota St. Paul International Film Festival) and HIFF (Harlem International Film Festival). At 12 years old, Kojo Odu Roney is already a master drummer. His charisma and wit are charming in Director Michael Fequiere's film. Fequiere took PBS through his work about the young prodigy. Read the Full Q&APBS: Kojo has an impressive work ethic for a child his age, waking up early to work on his music and creating his own drums. How did you learn about his story? Michael Fequiere: I was introduced to Kojo about eight years ago. His older sister and I were friends in college. She invited me over one day and that's when I met Kojo. He was five at the time, but he had four years of training under his belt so the discipline had already been instilled by his father. It also helped that he had, and still has, a natural enthusiasm to play the drums, and when you mix that with the discipline, the results are what you see today. The National Black Programming Consortium is committed to a fully realized expression of democracy. We support diverse voices by developing, producing and distributing innovative media about the Black experience and by investing in visionary content makers. Founded in 1979, the National Black Programming Consortium (NBPC) develops, produces and funds media content about the Black experience for public media outlets, including television, digital radio and online. Since 1991, NBPC has invested more than $10 million dollars in iconic documentary content for public media outlets, including PBS and PBS.org; trained, mentored and supported a diverse array of producers who create content about contemporary black experiences; and emerged as a leader in the evolving next-media landscape. NBPC distributes engaging content online at BlackPublicMedia.org and via broadcast through its AfroPoP: The Ultimate Cultural Exchange documentary series. WNED | WBFO is a trusted public media resource that enriches its audiences by providing educational, entertaining programming and services, as well as engaging the Western New York and Southern Ontario communities through cultural and civic involvement. © Copyright 2017 WNYPBA. All rights reserved.